Now you see it: now you don’t – well that was just about how I felt for a long time about Mr E’s latest offering. Apart from that hated word ‘jumbles’, the preamble offered nothing daunting and a quick read through confirmed that Mr E retains his ticket for the Listener Setter’s imbibing club, with a couple of tipply clues, ‘Step on it when entering to provide soldiers with punch (7) (not much alcohol there really DO + OR + MAT) and ‘America taxes belts of hard stuff (6)’ (A + TOLLS). My read through did confirm that there was a fine set of surface readings here, even if, like those two, most were very deceptive – as was definitely intended. Still, the other numpty was remarkably on form and in about an hour, we had an almost complete grid with a good sense of where our five jumbled clues were going to be. They were, not surprisingly, the last ones we solved. I suppose that says a lot about our solving technique (or mine, at least) which depends very much on the letters that are already in the grid for suggesting words that I then attempt to relate to the definition – that is the reason, I think, for my loathing of jumbles. All the same, FISHING TACKLE did seem to fit the clue for 36 across, and we had a lot of the letters already in place, suggesting that TACKLE would remain unchanged, leaving us to work out that an anagram of THINGS was going into the middle of ‘unsteady’ or FICKLE, and the letters already in place suggested that INSIGHT was the word we were going to be using. 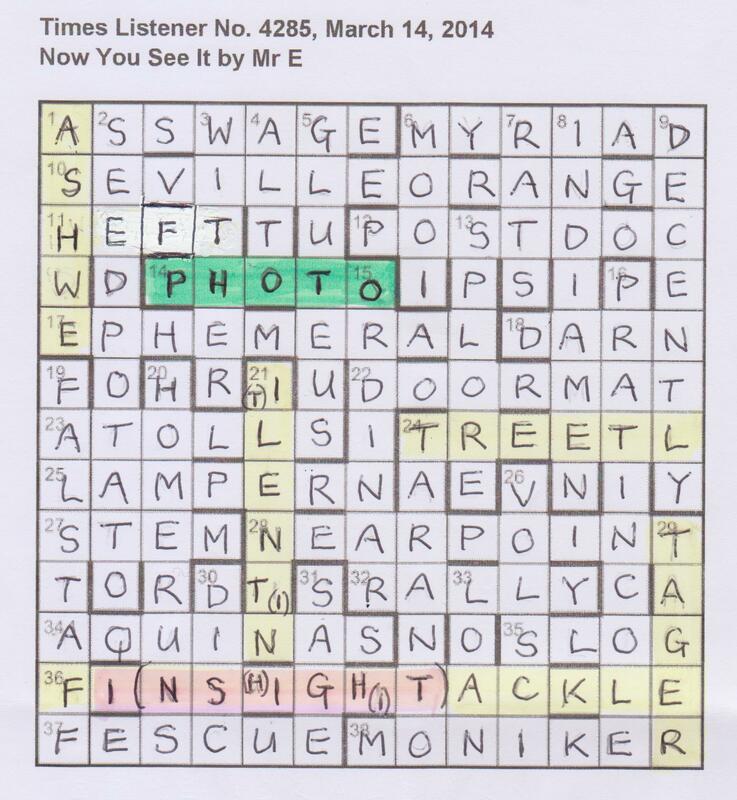 After all, it did relate, rather cleverly, to the title ‘Now You See It’ and to the EPHEMERAL that had slotted in at 17 across. The Numpty red herring? Of course there was. We learned that HEFT was another name for what we call a sheep cote, and that suggested that our lakeland word, HAWSE, was going to be entered as ASH WE. We already had LINNET (a lovely clue, the reverse of TEN NIL ‘Bird upset by one-sided result (6)’) entered as what could become I LENT N, so were we looking for something to do with Ash Wednesday and Lent? There was a TREE in TREETL ‘One formerly preventing sin, say (6)’ which might have rood connotations – but it didn’t quite gel did it? Especially as our last jumble was GRATE, entered as TAGER. Oh yes, of course we had first wondered whether it could be TIGER as he, too, has bars ‘This has some bars and spaces larger than others, I’d say (5)’ but it was difficult to justify the spaces, and, anyway, we needed a fifth jumble. So there we were: a full grid to stare at and something to do with INSIGHT to resolve. We muttered and fumed and got nowhere, so slept on it and, when I woke in the morning, I had almost seen the light. It occurred to me that TAGER needed a couple of Es round it to make ETAGERE – a real word, and Mr E might have considered that EE to have something to do with sight (well it has in Scotland!) So I fed the other offenders into TEA with asterisks around them and gave a hoot of joy (and kicked myself soundly) when STREET LIGHT, SILENT NIGHT, SASH WEIGHT and STAGE RIGHT all offered themselves with SIGHT neatly enclosing the offending jumbles. There was one last step and it took the other numpty about five seconds to spot a word that ‘might be found jumbled in another sense’. “Well”, he said, “It is most likely to be TASTE round something – TOOTHPASTE, for example”. Of course, there it was – PHOTO. Nice one, Mr E.
This entry was posted on 4 April 2014 at 4:00 pm	and is filed under Solving Blogs. Tagged: Mr E, Now You See It, Taste of Toothpaste. You can follow any responses to this entry through the RSS 2.0 feed. You can leave a response, or trackback from your own site.